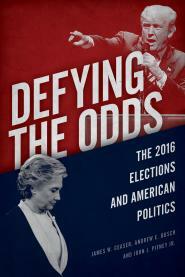 In Defying the Odds, we talk about issues that drove the 2016 campaign, and the forthcoming update brings the story up through 2018.
" We must create a new standard of living for the 21st century," President Trump said at the outset of Tuesday's State of the Union address, later urging the joint session of Congress, "Tonight, I ask you to choose greatness." But over the course of a speech that spanned nearly 90 minutes, Trump completely ignored the biggest long-term threat to American greatness: the looming federal debt crisis. When Trump took office in 2017, he inherited a substantial level of debt, which accumulated during President Barack Obama's two terms as the fallout from Great Recession coincided with the retirement of Baby Boomers. On the month Trump was sworn in, the Congressional Budget Office predicted that the debt held by the public would reach $24.9 trillion by 2027. Last week, two years after being sworn in, the CBO now projects public debt of $25.9 trillion in 2027. The CBO noted that by 2029, "federal debt would be higher as a percentage of GDP than at any point since just after World War II — and heading still higher." Unlike World War II, which was an extraordinary event after which the U.S. was able to pay down its debt over time, the twin problems of the aging of the population and rising healthcare costs mean that absent serious reform, the problem is always going to get worse. From Trump? Not one word.